Coulda used the elevator, Allison. Eeeeeee I missed seeing your comic in my RSS feed, Suzanne! 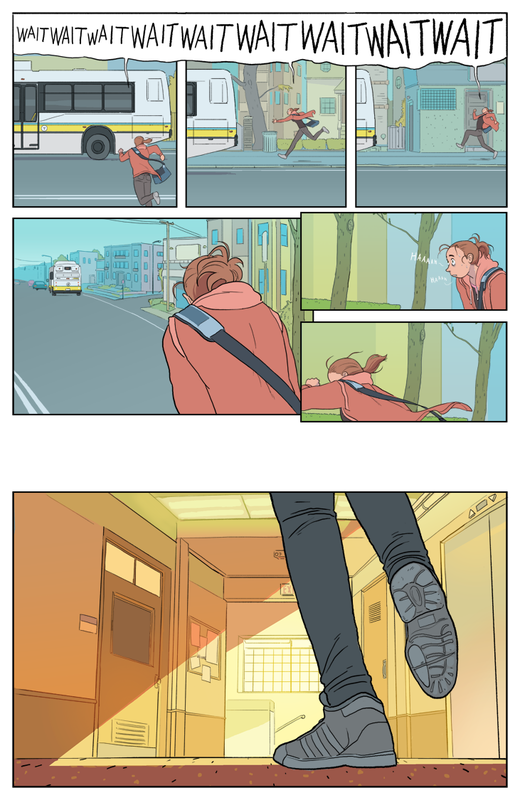 I can totally relate to Allison’s plights, this was a daily struggle for me this semester (catching buses, not seeing ghosts). Also, the lighting in the last panel is terrific; thank you so much for the beautiful artwork. I have not had both directions of my Friday commute on the MBTA go well in the past month. Broadway & Hancock in Everett to Riverside is a commute that makes me wish for death. Cooooool comic! Just found you through The Meek, and couldn’t stop reading. Your drawings are awesome, and the storyline is super interesting, I’ll be coming back forever now! My favorite thing about the MBTA is that sometimes the bus is late by longer than the scheduled time between buses. My second favorite thing about the MBTA is that sometimes you have to pay twice because your transfer bus is more than 30 minutes late. … been WAITWAITWAITWAITWAITWAITWAITing for a month now… is this comic officially on hiatus? Sooooo… is Brainchild on hiatus? I’ve been waiting so patiently and the character designs are nothing short of amazing! Can’t wait to see where the story goes from here. When will this awesomeness continue? Needless to say, READER IS ENGAGED.